Kenan Thompson's line in the beginning of the skit sums it up best-- "Alright, now let's make some 'Dale." This past weekend, Halsey was both the host and musical guest of Saturday Night Live. While typically the host and musical guest are two different people, Halsey showed she can multitask and took on both in the same show. Other stars who have done double duty in the same way include Justin Bieber, Lady Gaga, and Miley Cyrus. Halsey seemed to do everything on Saturday, from singing to painting a giant upside down picture. But her role that made us laugh the most was her portrayal of Lilli Reinhart, a.k.a. Betty Cooper, on a Riverdale satire skit. 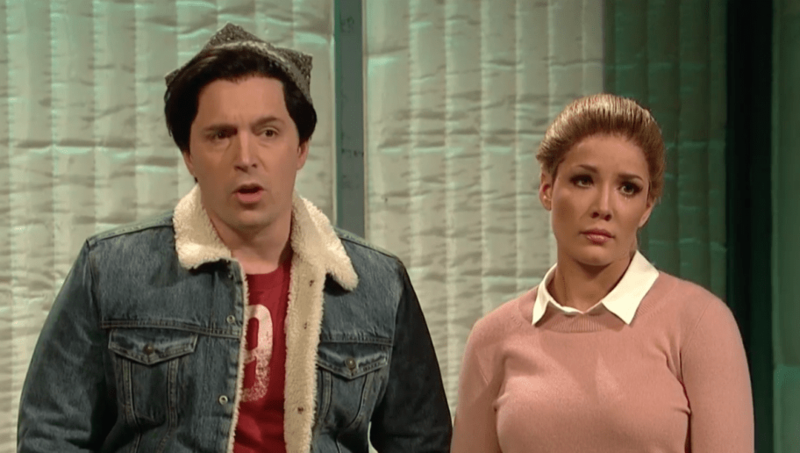 In the skit alongside Beck Bennett as Cole Sprouse's Jughead and Pete Davidson as, uh, a corpse actor with some choice methods, Halsey got us with her spot-on impersonation of the melodrama associated with the popular CW teen drama. The premise of the skit is that Davidson's character, an actor who "plays corpses," wants the portrayal of the dead body to be realistic, complete with groans and thrashing. When the director disagrees, Halsey and Bennett begin to back up the overly realistic actor. The actors drop lines that align perfectly with the show's over-dramatic tone. "Death is just a cruel teacher in Riverdale," Bennett's Jughead hilariously remarks at one point. The skit felt just as dramatic as the show itself, and we are here for it.